﻿﻿ I think that by letting your work tell a story or telling a story to go with your work captivates your customer audience and keeps them in your shop just a little longer. In the case of this articulated Owl necklace "Mrs. Owl Gets Rose for Honorable Mention" I tell a story to go with my work. Your visitors will enjoy going to your Etsy shop just for the sheer pleasure of the visit, even if they might not purchase anything at that moment, they will love your shop and may at the very least heart your item or shop and come back. They might also be inclined to visit your other items to see what you wrote in your descriptions. When customers do searches on Etsy and use the "All Items" feature they might use search terms that are more theme oriented other than just what might be used for the tags and materials. "Mrs. Owl", as an example, when searched for under "All Items" brings up several owls with female personalities and cute whimsical features. This way of searching can be more helpful than the other ways in the Etsy search pull down menu because the tags are mostly used to describe the basics and get used up really fast. Other searches that my Mrs. Owl comes up in because of the story are "honorable mention" and "pageant". Who knows maybe she will end up being an award for someone in her exact predicament! 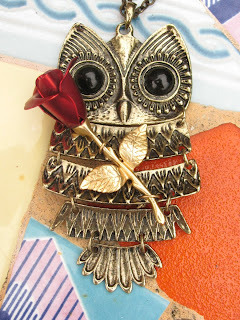 The description that I used not only describes the owl necklace I made but tells a story so the reader knows that this is also a two part story which draws the consumer to possibly look at my sold items to see part one.